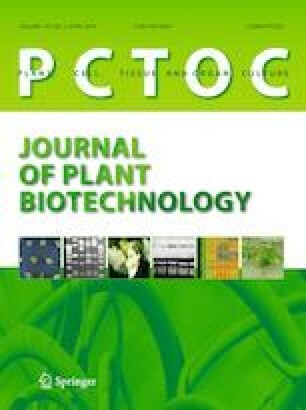 Leaf, petiole and root of triploid (Populus alba × P. glandulosa) × P. tomentosa were cultured on a medium containing benzyladenine (BA) and naphthaleneacetic acid (NAA) either alone or in combination with thidiazuron (TDZ) for the study of adventitious shoot regeneration. The study demonstrated that TDZ played a primary and distinctive role in shoot regeneration: the frequency of shoot organogenesis of explants cultured with TDZ (71.16%) far surpassed those cultured without TDZ (30.42%). Among explant types, high variation was observed in the regeneration capacity: petiole and leaf had better regeneration capacity than that of root. To understand this difference, an analysis of endogenous hormones (zeatin (ZT), abscisic acid (ABA) and indole-3-acetic acid (IAA)) was conducted on leaf, petiole and root explants. The results showed that the regeneration ability of explants varied dependently on their IAA and ABA contents. The organogenic capacity varied significantly with the position of the explant along the shoot axis. The highest regeneration potential (98.33%) and shoot number (up to 9.4 shoots/explant) were obtained in leaf explants harvested from the intermediate node (node 3). Regenerated shoots transferred to the medium containing 0.5 mg l−1 indole-3-butyric acid (IBA) achieved the highest frequency of rooting (100%), with means of 5.33 roots per shoot and 6.32 cm length per root. The shoots with an abundant root system were later transferred to the greenhouse for further growth and development. The effect of plant growth regulators (PGRs), explant type, endogenous hormone contents and maturity of explant was evaluated on adventitious shoot regeneration of triploid (Populus alba × P. glandulosa) × P. tomentosa in this study. Communicated by Maria Antonietta Germanà. This research was supported by National Natural Science Foundation of China (No. 31530012). KXY and ZQQ conceived and designed the experiments; ZQQ and HZQ performed the experiments; ZQQ analyzed the data and wrote the manuscript; HZQ processed pictures.